Blender is inexpensive, practical and convenient accessory, with which you can easily make vegetable purees, soups, sauces, creams or mousses. The device is useful for the preparation of baby nutrition and diet food. Besides, it is easy to wash and dry, and the immersion blender takes up very little. Compact and lightweight immersion blender lets you blend soups right in the pot, not pouring them into other containers. With the help of this device can be turned into puree cooked or raw vegetables, to make mince, whip mousse, sauce or cream. To perform all these operations will help to a set of interchangeable nozzles, which are equipped with every blender. For cooking you can use any container. We should proceed carefully - in the absence of the protective cover, the liquid and small pieces of food can spread throughout the kitchen. The unit is suitable for grinding or whipping small batches of products not intended for long continuous operation. Choosing model, consider the power and weight of the device, as well as the number of nozzles and additional accessories, for example glasses for the storage of finished products. The cream can be replaced with milk, the soup will be more diet. In a saucepan put the washed chicken Breasts, fill them with water, bring to a boil. Remove the foam, add salt and cook the chicken until tender over moderate heat. Then, remove the breast, cut the meat and set aside. Zucchini peel, the pepper, remove the partitions and seeds. Chop the vegetables and place them in the broth. Cook until tender, return to the pot the chicken and preroute soup immersion blender. Pour in a saucepan the cream, add salt to taste and mix. Heat soup without boiling, and then sprinkle with freshly ground black pepper and pour into plates. 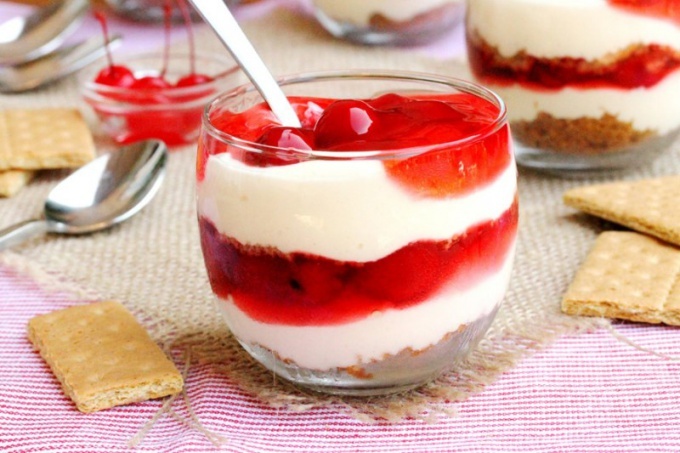 With an immersion blender, you can quickly prepare a delicious dessert - mousse fresh berries with a layer of cookies. - fresh mint for decoration. Berries wash and dry. Place them in a deep bowl and blend with an immersion blender. Stir in the sugar and then one by one add the egg whites while whipping. You get lush homogeneous mass. In a mortar mash shortbread biscuits, broken into pieces. In wide glasses, place a layer of berry mousse, then a layer of shortbread crumbs and another portion of the berry mixture. Decorate each portion with leaves of fresh mint. Before serving dessert keep in the fridge. To prepare fruit cocktails is easy: you just need to add in the blender the fruit and any liquid and press the button. On the other hand, to make a really tasty smoothie, you need to exert more effort and exercise skill. You need to carefully choose the fruits, focusing not only on the degree of their ripeness and quality, but given the flavor combination of ingredients. The amount and type of liquids that you add in fruit cocktail, has a huge impact on the flavor and consistency of the drink. You can also add other ingredients to increase the nutrient density of your shake to change the taste. Take the fruit you want to add to the cocktail. Use only the ripe and fragrant fruit. Join in the cocktail fruit with different flavors. For example, tangerine will add a sweet and at the same time, spicy citrus flavor, and the bananas give a creamy sweetness. Mixing different flavors, you can cook more sophisticated cocktail than using similar flavors in one drink. Add 1 Cup of the fluid you chose in the blender. Among the options – soy milk, regular milk, yogurt, juice or water. If you like thinner smoothies, add 2 cups. Better to add less, in order to correct the consistency. Add the fruit to the blender. If necessary, cut the fruit into pieces. You can also add honey, spirulina or protein powder. Start to grind the ingredients in a blender on low speed, gradually increasing it to the maximum. Whisk until a homogeneous consistency. Try the cocktail. If it is too thick, add more liquid. If too liquid, add fruit. You can tweak the flavor and degree of sweetness. If the cocktail is too sweet, squeeze a little lemon juice. If it's too sweet, add honey. Again shake the cocktail in a blender and try to verify that you achieved the desired taste. 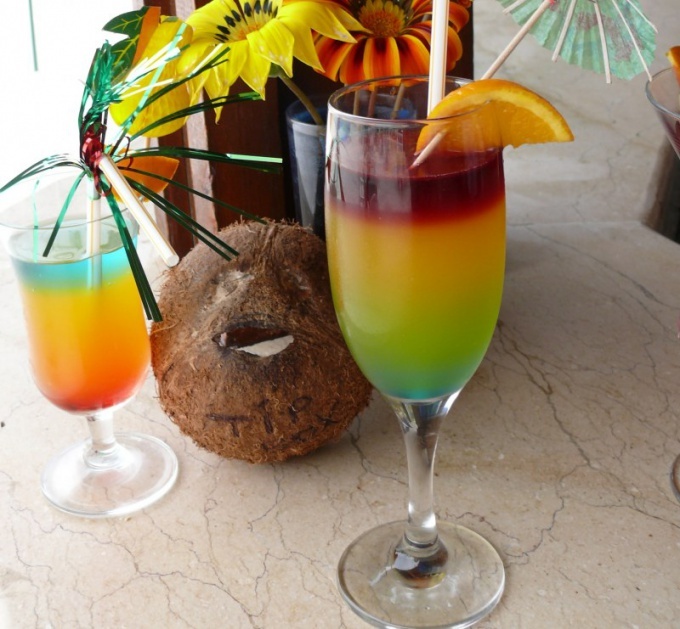 Refreshing fruit cocktails, they are also called smoothies can be made from any fruit and berries with the addition of dairy products, honey, nuts. Besides that they are delicious and nutritious, freshly prepared cocktails rich in vitamins. — 1/4 tsp of almond extract. — powdered sugar for decoration. — 100 ml Apple syrup. Berry-banana cocktailChop the banana chopped in a blender into a homogeneous mass. Add the berries and whisk thoroughly. A few berries leave for decoration. From apples squeeze out the juice. Pour in the banana weight Apple juice and mineral water. Again beat well. 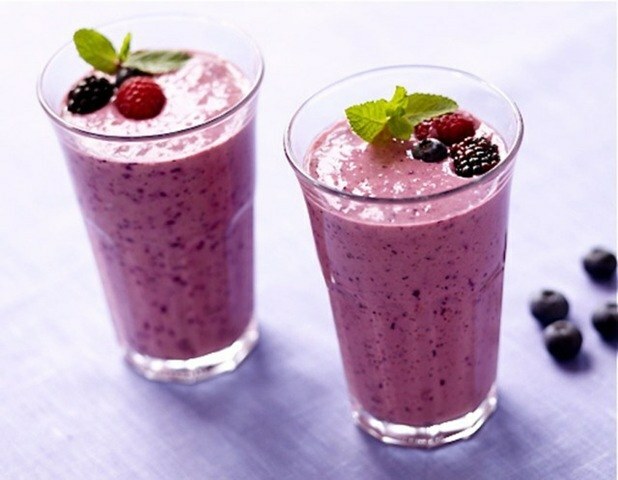 Pour prepared berry-banana smoothie into glasses, garnish with fresh berries and refrigerate. Serve the drink along with honey. Fruit cocktail "Morning"Cut the banana into pieces and grind it in the blender along with the strawberries. Pre-thaw the berries need. Pour orange juice, milk and almond extract. For this drink it is better to use skim milk. Mix fruit cocktail, pour into glasses and serve immediately on the table. Cocktail "summer snowstorm"Squeeze the juice of peeled fruit — apples, oranges, kiwi and lemon. Half of the lemon juice set aside. 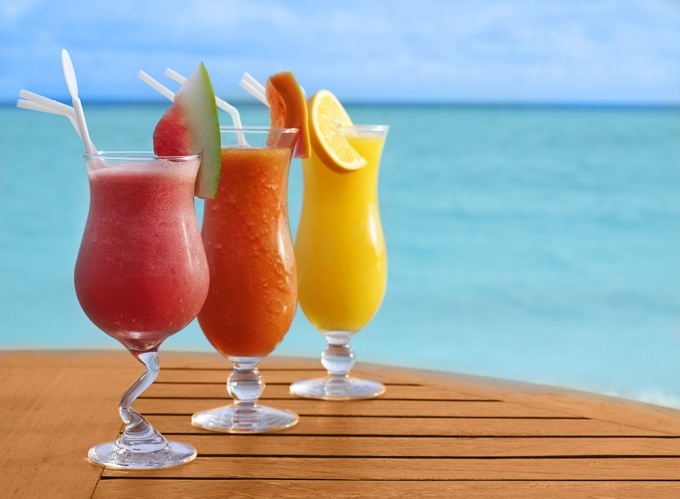 Mix freshly squeezed fruit juices with sugar, milk and ice cream. Fruit shake-a milkshake with a whisk. Prepare the glasses. Dip the edges in lemon juice and then in powdered sugar. Pour the cocktail into glasses. Serve "Fruit Blizzard" with a straw. Cocktail "Vitamin charge"Chop frozen strawberries and blackberries in a blender until smooth. From orange squeeze juice. Slice the bananas. Add the berries bananas and sugar. Mix thoroughly. Dilute banana berry lot of orange and pomegranate juices. Pour the cocktail "Vitamin charge" their glasses. Fruit cocktail with Legambiente of Apple juice. Ice crush into crumbs. Frozen berries blend. For this cocktail suits strawberries, raspberries, blackberries, and currants. Add to the berry mix Apple juice, sugar syrup and crushed ice. Stir the mass. Pour the cocktail into the glass. Garnish with sprigs of mint and fresh berries. Blender is a versatile kitchen appliance. With it, you can whip up your smoothie or mousse, make a soup, souffle, pie or other delicious food. Use a blender with a Cup or plunge - the mash, grind and whip. Try to prepare a simple first course - soup. With a blender it can be made completely homogeneous. Choose the ripest tomatoes - unripe will not give saturated colors. If the soup seems too pale, add a tablespoon of tomato paste. Wash tomatoes, dry and cut into small pieces without removing the skin. In a deep frying pan, combine oil and butter, melt. Finely chop the potatoes and onion, place in a pan, add the tomatoes. Simmer until all the vegetables are soft. Pour in the mixture in the chicken broth and milk. Add the sugar, chopped Basil, salt and freshly ground pepper. Stir and simmer for 15 minutes. Cool the soup, pour it in the bowl of a blender and preroute. Then heat the mixture in a saucepan. Serve the soup in bowls, sprinkle each portion with pepper and add a tablespoon of cream. This beautiful dish makes a wonderful side dish to meat or fish. It is possible to prepare any root vegetables - sweet potatoes, yams, rutabagas or turnips. Clean the vegetables, cut them separately, boil in salted water until soft. Preroute vegetables immersion blender, then place on the pan and allow to evaporate excess liquid. In every part of carrot and potato and add the sugar, nutmeg, pepper, 1 yolk and half the butter. Place carrot and potato puree in a pastry bag and put it in a two tone rosettes on a baking sheet, greased. Bake in the oven preheated to 200oC, for about 20 minutes. Delicious and healthy dessert cocktail with bananas and ice cream. To make it easier to blend with the bowl. Use very sweet overripe bananas. At the request of the sweetness of the drink can be enhanced by adding a little liquid honey or syrup. - 1 tsp coconut flakes. Smash peeled bananas into pieces and put into blender. Preroute fruit, pour the milk, add the ice cream. Whip the mixture into a homogeneous mass, pour it in the chilled glasses. Each serving sprinkle with coconut flakes and serve.